Roku is a hardcase to describe. Considering his personality is to an extent undescribeable. In every situation his mood can be different and change giving him the assumption by others that he is 'bi-polar' which in truth he actually is. He is a loose cannon whom can at times control how he acts if it needs to be done but otherwise he is 'random' in short. A best friend could get the nicest side of him possible one day then get a kick to the face the next. He's unpredictable, describing him would be to describe him in hundreds of ways. As his personality easily changes almost every day. Roku being an aspiring Anbu agent currently wears a certain attire of sorts. Almost in preparation for a task that may never come. He has -dyed- dark-black hair that comes down to near shoulder length but doesn't get in his eyes because of the positioning of his headband. He has eyes that usually stay halfway closed making most think he is just lazy but he naturally has them this way. Three markings on his right cheek and bandages wrapped securely around his neck. He wears a fishnet shirt underneath the thin armor he wears. The armor itself does not cover his arms or shoulders and only protects him lightly. The armor itself not being for much more than keeping out projectiles. He wears half-sleeves on the bottom of his arms and forearm protectors which can easily be removed. His half-sleeves also act as gloves but the gloves are removable on will. He is rather somewhat physically built but still could use limited improvement on his body. He has a well-toned chest and definitely has quite good abs. His pants are a bit more baggy-styled but they accomidate his knee guards which he has on each knee firmly not halting his knee's movements. Black pants and black normal shinobi-styled footware. Not much of his physical body is revealed. He stands at six foot three currently and is still growing. He has raven eyes and has no noticeable scars on any part of his body other than his hands meaning he likely keeps good care of his body thus far or has tried to avoid injury during the academy. Momochi, Roku is a descedant. 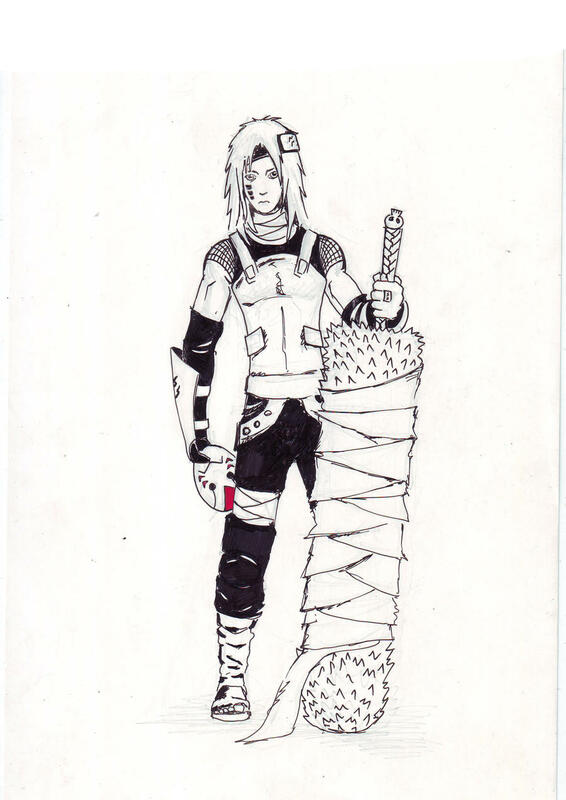 The son of his deceased father Momochi, Zabuza. He is a child whom was given birth by his father before his father had ever left Kirigakure. But he was still a child when his father left a baby even. Nonetheless he had been told stories most of his life about his father. Several even shunned him in the bloody mist because of his father. He had to earn his place a lot harder in his village because of his father's actions which so heavily affected him before his death. His mother being a sole parent to him most of his life whom passed away not too long before he joined Kirigakure's Academy. The male after the academy lived alone as he still does happily so to say. He has little to no family anymore but inherited his father's sword. The Beheader. Although his is horrible with using it currently he is still training to use such a sword at it's maximum usage. He still needs lots of training but physical training on his body is something he does not lack to do daily. The sword itself was only recently given to him after he graduated from the academy. It is the only thing of his father's he has and is the only thing he cares for preciously. He is a inspiring Shinobi to be one of the new generations Seven Swordsman of Mist in his father's place. He has been given a cruel life thus far but does not let it affect him generally. He lives day by day. The sword itself being his most prized possession he wont even let anyone else touch it. The sword making him a target to any collectors that may form puts danger over his head he'll have to deal with. However he is in practice to one day become a Anbu or 'Hunter-Nin' for Kirigakure. The village he is in. He hopes not to ever come to the decision his father made. He does not currently wish to leave the village hidden in the mist but history repeats itself and father like son. It could possibly occur. His life itself has been boring for the most. He is a loner and not the type to really live with anyone else. He is more about his training currently than to need to do things like that. But he has only recenty become a Genin so his 'journey' is only just beginning. Description: Shinobi are agile, witty, and have various means to escape their bonds. This is an easier way of getting out of rope bonds. Does not apply for very tightly-wrapped metal chain or wire. Description: A high-speed movement technique used by ninjas to move over short distances with accelerated speed to surprise opponents. This movement may be disguised with leaves or items from the native village's elements, making it appear as though the user is teleporting, but the jutsu itself is not a Space-Time Ninjutsu. Description: A Ninjutsu utilized by Hidden Mist ninja. The ninja causes the area surrounding their target to be covered in fog. The low visibility allows the ninja to move silently and stealthily. One with enhanced senses beyond eyesight or those with Doujutsu capable of seeing through the fog have a better chance of sensing opponents through the mist. I found the site by FoF Affiliate. I see nothing wrong but you won't be able to start with Zabuza's sword but you could always just carry around a long sword but you'll have to wait before you get the sword it's self so change that to maybe a long sword instead other then that nothing's wrong. You only start with two jutsu as well. You have three listed. Otherwise, yeah, you cant start with a "Legendary" weapon. Eh. Alright then. Couldn't think of a new character after I brainstormed this one for about two days. Cya then.